A friend shared this image today on her Facebook page. It caught my eye because as chronic pain sufferers, we get asked about our pain level all of the time by a variety of specialists. Burning Mouth Syndrome is a novelty to some doctors we encounter, and a pain chart helps to accurately convey the level of pain you experience and how it affects or inhibits your daily activities. Often it is a range, and with BMS, this is particularly true because our pain escalates throughout the day unless we find coping strategies or a medicine that provides some intervention. This “improved” version adds a bit of humor to the pain scale (bees, bears and ninjas? ), but also makes the point that if you are truly at the top-level of pain (10 is the top!) then you are incapacitated or have been rendered unconscious by the level of pain and medical intervention is required immediately. I was surprised by the comments that accompanied the image. Some laughed, but others were angry, feeling that the image was mocking their pain. Some even took the scale to task for not having enough numbers, because their pain was “at least an 11 or 12!” Others berated the creator for not including labor, even though that is a pain that only affects one gender. If you are here for information about Burning Mouth Syndrome (BMS) and my journey with it, you are in the right place. 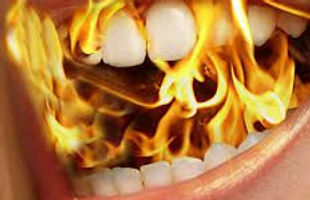 I am continuing the information I shared in “A Pattern of Pain – Burning Mouth Syndrome, so feel free to read that post first if you haven’t already. I outlined my experience with Klonopin/Clonazepam ODT Dissolving wafers and how much better they seemed to manage my pain. This is still the case, but I wish I could tell you that I was completely out of pain, or better yet, in remission. Neither is true, unfortunately. I have good days and bad days, but fewer bad days than I used to. I have been suffering from Burning Mouth Syndrome for nearly six and a half years now.